You know when you’re munching on food and you tell yourself “just one more bite”, but before you know it you’ve eaten the entire thing. Well let me warn you, these Buckwheat Pumpkin Clusters will be that kind of food. eating a cracker without the salt. Contrary to its name buckwheat is not a grain or cereal, it’s the seed of a flowering plant which makes it grain and gluten-free. It is also a good source of b vitamins, magnesium, manganese, niacin and copper just to name a few. Something else buckwheat has that’s good for you is resistant fiber. This fiber is known to help lower blood sugar after meals and it also helps with weight loss. Buckwheat groats which is what I used in this recipe contains more of this resistant fiber than any other form of buckwheat and that’s a very good thing. I generally purchase raw buckwheat groats by the pound from the bulk food section at Whole Foods. I soak them several hours and dry them in my dehydrator before consuming. 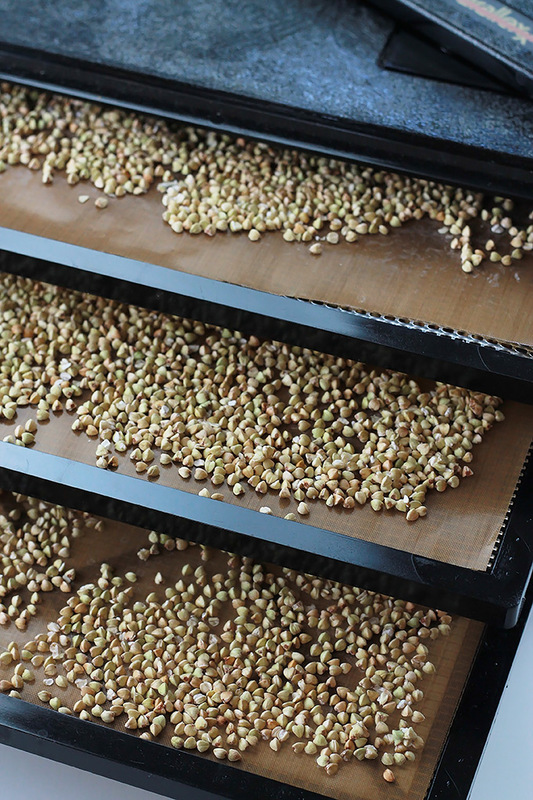 I soak them because it helps to make it more digestible and it removes some of the phytic acid from the buckwheat. Phytic acid is an antinutrient that prevents the body from absorbing important minerals and high levels of it can cause mineral deficiencies. After soaking and drying I simply store in an airtight glass container so it’s ready when I’m ready. I bring the pumpkin puree, maple syrup, spices and salt to a boil, when it thickens just pour, stir and bake. It hardens as it cools and then I dig in to all of its crispy goodness. 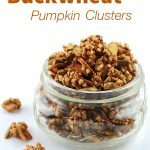 These Buckwheat Pumpkin Clusters makes a pretty good after workout snack because buckwheat is a good source of protein. It would also make a nice hostess gift for the upcoming holiday season. You can eat it as a snack or have it as a cereal with milk, in a salad or over a bowl full of yogurt. 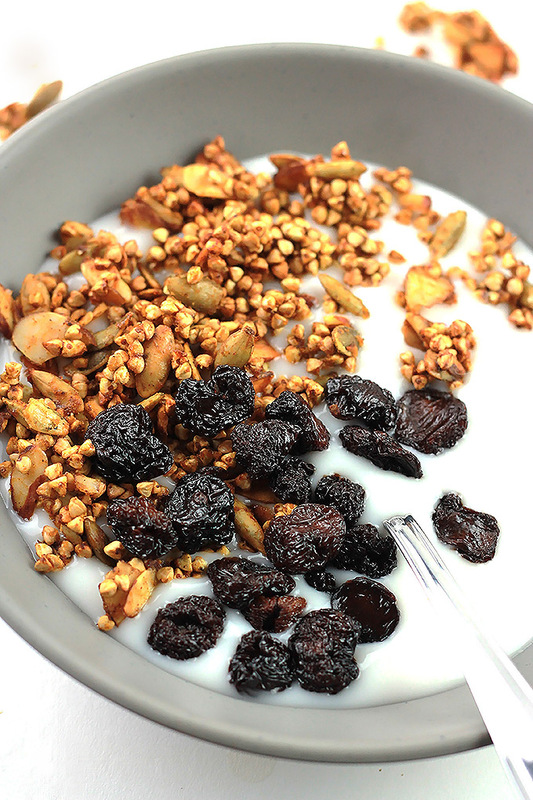 I served mine over coconut yogurt with dried cherries, so yummy. Pre-heat oven to 350 degrees and line a large baking sheet with parchment paper. 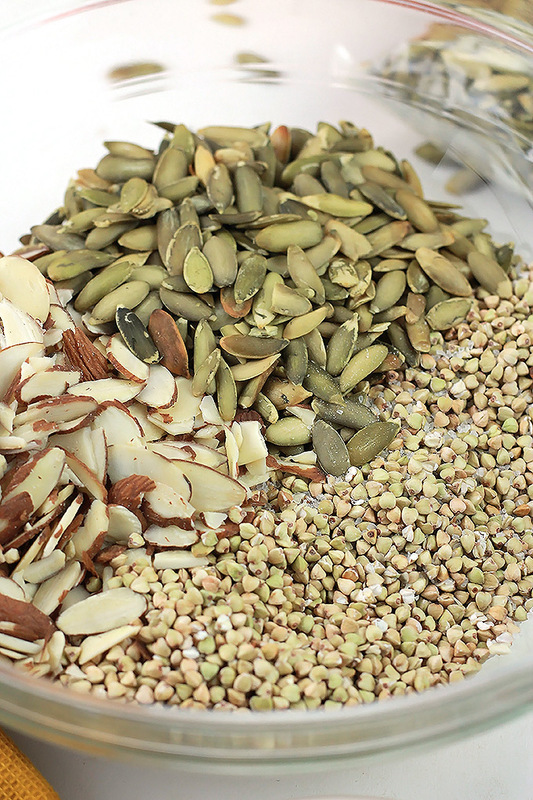 Poss together the buckwheat, pepitas, and almonds in a large bowl. Mix together pumpkin puree, syrup, pumpkin pie spice and salt in a medium saucepan and bring to a boil over medium high heat. When it starts to boil, reduce heat to medium low and stir constantly for 2 to 3 minutes more or until it starts to thicken. 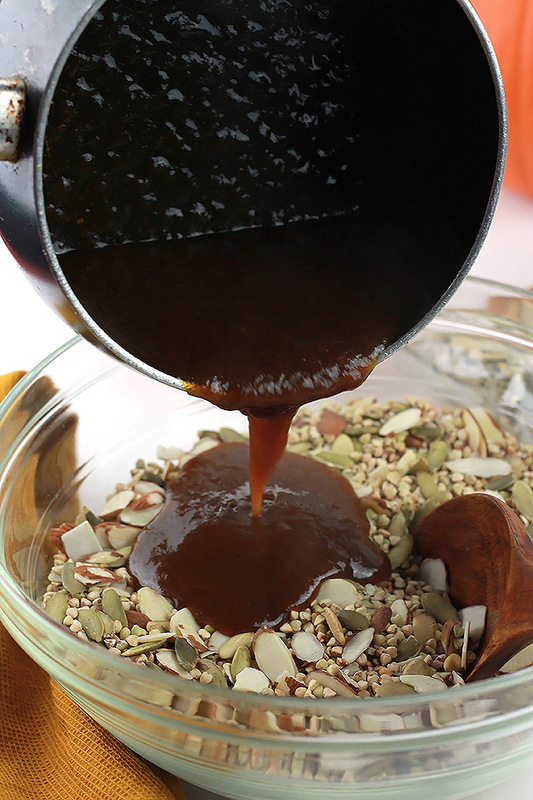 Pour the syrup mixture over the buckwheat, pepitas and almonds and toss until all of the buckwheat mixture is moistened. Transfer to prepared baking sheet and spread evenly. Bake for 25 to 30 minutes or until it’s golden brown, tossing every 10 minutes. Remove from oven and allow to cool, it will harden as it cools. 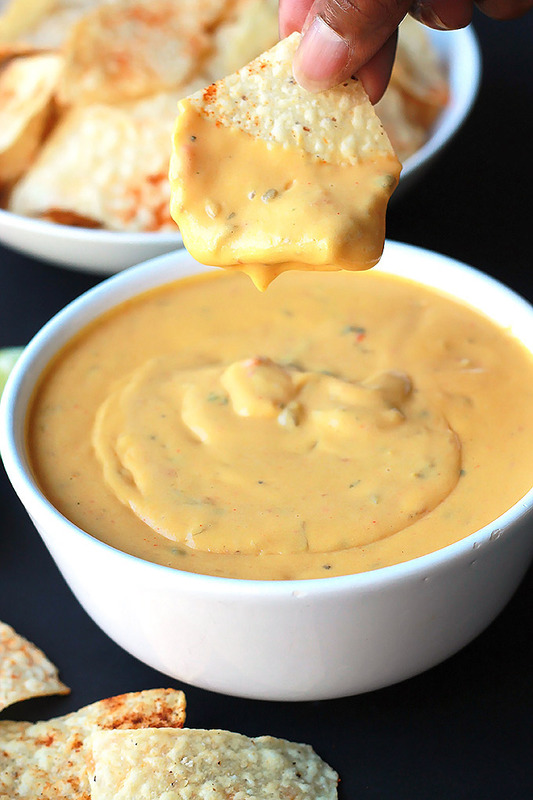 Enjoy immediately or store in a sealed container at room temperature for up to 2 weeks. 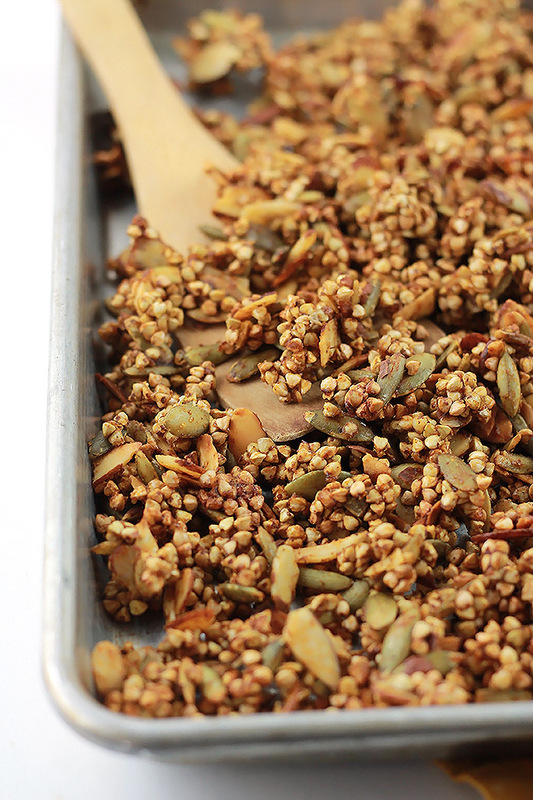 For more of a granola you can add in one cup of oats and increase the pumpkin puree and syrup by 1/4 cup each. 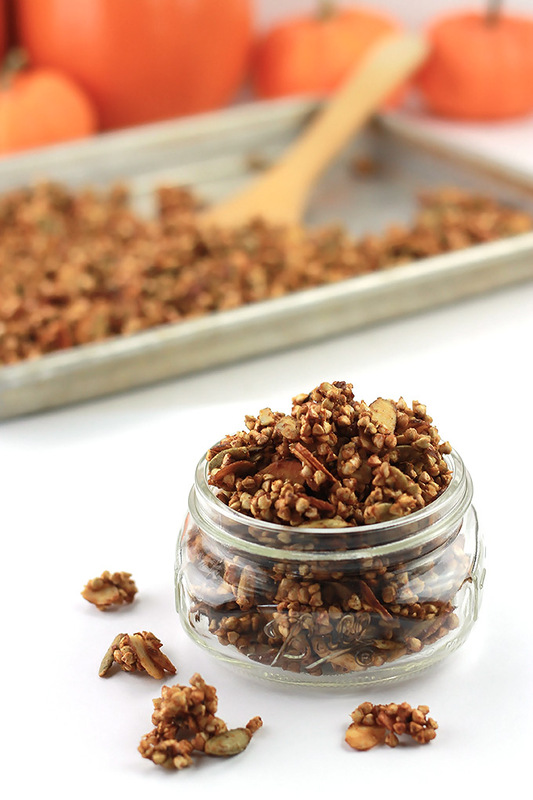 Question: Do you eat buckwheat?, If you do, how do you eat it? i DON’T eat buckwheat but you’ve got me convinced. If a child can love it, so could I — ESPECIALLY with pumpkin! Thanks Crista, Give it a try and let me know what you think. If you like pumpkin as much as I do you can add a bit more of the spice. For this recipe I kept it in the middle, enough to give it flavor but not too much to overpower. These look so good. We are always looking for gluten free snacks. This looks delicious, and it’s so healthy. Thanks for sharing. They are so addicting it is hard not to eat the entire thing. My daughter who is a picky eater loves it. Wow, I’ve never had it in ice cream, I’ll have to give that one a try. I’m glad this inspires you. Enjoy! 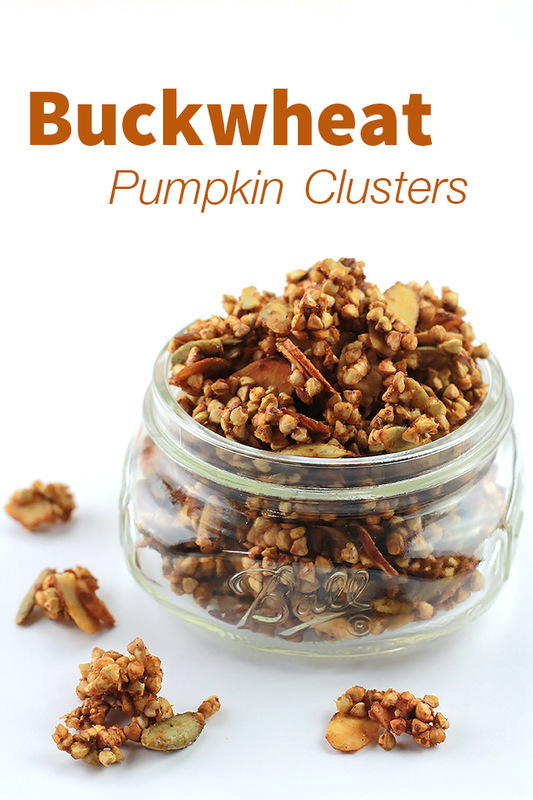 Good Monday Morning Celeste, I just made these buckwheat pumpkin clusters and they are DELISH! I thought I’d have to head to my health food store for the groats, but lo and behold, I had almost 2 cups in my refrigerator. I’m not blessed with patience, so I skipped the soaking and drying and whipped up a batch this morning. I also subbed pecans for the almonds. Like you said, absolutely addictive! I’m a sucker for the salty sweet thing and this treat strikes the perfect balance! YUM!!! Looking forward to trying more of your delectable and nourishing recipes. It’s nice when we have what we need in our fridge or cabinets, no trips to the store. I’m glad you had a chance to make them and love them as much as I do. Celeste, just had to pop back in and let you know that I scooped up what little of the pumpkin clusters were left and brought them up to my daughter who is away at school…I didn’t tell her what was in them, though she is a very healthy eater, i just said ‘try these’. She started tasting and her eyes got bigger!! She is devouring them. Now I need to go buy more buckwheat groats and make more when we get home. Thanks Lynn for letting me know, It really is hard to stop snacking on them, I may just have to make another batch. Hi, I am new to your site and I would like to make this recipe but don’t have a food dehydrator. Do you have any suggestions, thanks. 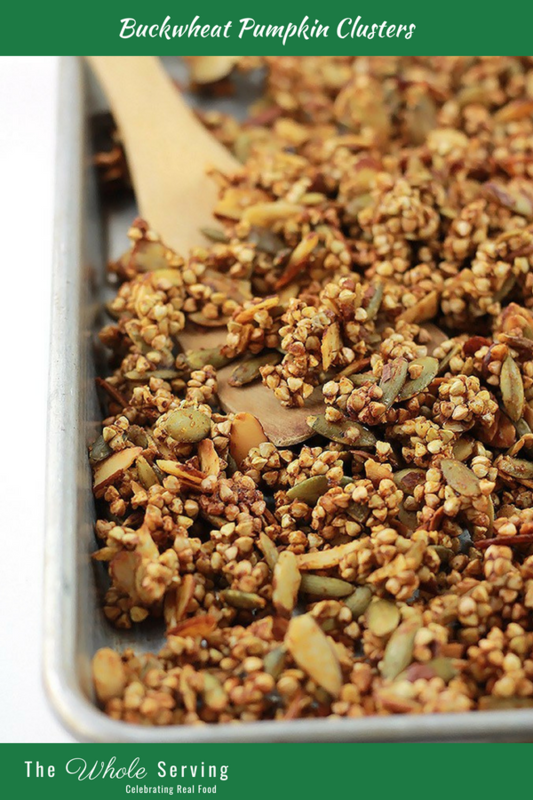 Hi Jerilyn, you can try dehydrating them in you oven on the lowest setting or just make the clusters without dehydrating the buckwheat. 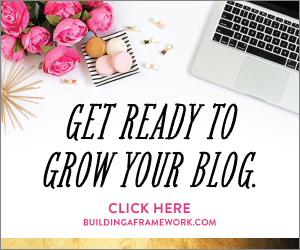 Let me know how they work for you and thank you so much for visiting my site.